Mid 17th century Herbalist Nicolas Culpeper was very influential in his time, and somewhat of a medical renegade. He was passionate about plants and their healing powers. A champion of local plants for local people and for healing the poor, I still find his way of describing herbs wonderful to this day. Using lemon balm as an example, he says: "it doth open obstructions of the Brain and hath so much purging quality in it.. as to expel melancholly vapours from the spirits and the blood which are in the Heart and Arteries." Modern research into lemon balm does indeed look promising for its use in Alzheimers and Dementia, and it is still used for its thymoleptic (uplifting) and anti-anxiety qualities by herbalists to this day. 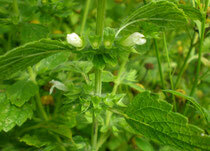 It is also a useful carminative herb which reduces bloating and abdominal discomfort.